If you study Spanish on a Spanish language course at our school in Alicante, you will love the location of the school, just a short walk from the beach, and will soon really enjoy the wonderful Mediterranean climate and relaxed way of life. 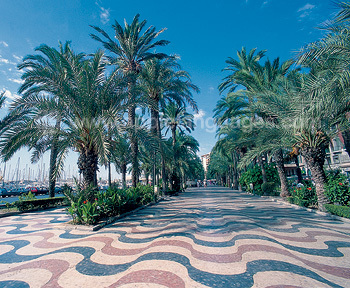 However, Alicante is also a modern Spanish city with excellent shopping, as well as a nightlife which is second to none. Alicante is a place where you can study seriously on a Spanish language course, but at the same time relax and really enjoy the experience, as you learn Spanish in Spain. Our Spanish language school in Alicante is ideally located, in Alicante’s old town close to the Teatro Principal and just 7 minutes’ walk from the beach. The school has 7 air-conditioned classrooms, a study room/library, video room, student common room and Internet access. The maximum group size at our Alicante (Old Town) school is 9 students, so students receive lots of individual attention and learn Spanish faster. 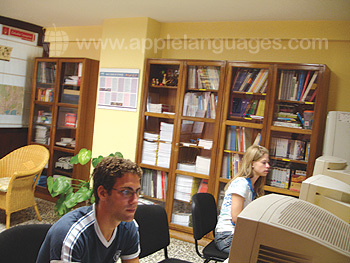 Our school offers a wide range of Spanish courses. You can study Spanish on an ‘Intensive’ Spanish language course of 20 lessons/week, or else on an ‘Intensive Plus’ Spanish course, combining 20 group lessons/week, with 10 private Spanish lessons/week. There is also a ‘Super-Intensive’ Spanish language course of 30 lessons/week, as well as a DELE exam preparation course, if you want to study for this exam. Our school in Alicante also arranges Work Experience in local Spanish companies for students who want to stay on in Spain after their period of study has finished. Students can stay in reasonably-priced shared student apartments, in private studio apartments, or else with carefully selected Spanish host families. Staying with a Spanish host family helps you learn Spanish more quickly, as you practise with the family the Spanish language skills that you study on the course. The activities programme offered by our school in Alicante will not only give you the opportunity to meet your fellow students, but should also teach you more about the local area and culture. In addition to this, activities are conducted in Spanish and you will be encouraged to speak Spanish whilst you are on activities, which should really help to increase your confidence! Examples of typical activities arranged include Spanish culture classes, guided museum tours and excursions to places such as Tabarca Island and Ibiza! Our Spanish language school in Alicante also organises airport transfers from Alicante Airport, for students who want to be met on arrival and taken to their accommodation. Average score for our school in Alicante (Old Town) based on 22 previous client reviews. It was a great experience. I have enjoyed every lesson. I would like to mention especially Cristina y Juanma. They helped me to speak in Spanish. They gave everyone the attention that was needed. The owner of the house is very nice that made my stay very cozy. My room was a little dark but the time you stay there is short. The environment, close to the school and the kindness of the woman were much more important. When I would take classes again in Alicante, I would definitely stay with her. The teachers we had were very good especially Carmen and she was happy with our level in her class. 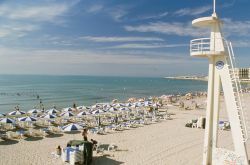 The hotel Mendez Nunez which was recommended was excellent and ideally positioned for the school, beach and restaurants. The cultural visits were excellent and the timetable of classes in the morning with visits in the evening worked very well as it gave time for relaxation in the afternoons. The course that I attended was highly informative and I learned a lot in just 1 week. In all I enjoyed the week with the friendly staff and students. Excellent in every way. They chose exactly the right level for me, only 3 in my class and we did quite a few activities around the city which made it more fun. The course was tailored to my needs, it was exactly what I needed. The accommodation was great, a typical Spanish flat. I loved my course. The staff at the school were amazing!!! It was such a relaxed atmosphere that it was really easy to learn. They methods they used to teach meant that it was a fun and intereting way to learn the language. I'll miss it very much. Teachers very pleasant and had a programme for us to follow. Pleased I was put in a group that felt at the right level as i felt I was stretched but not out of my depth. Good to learn with different nationalities. I have had a great time with competent teachers who enjoy teaching. Their lessons were well prepared and they still gave the priority to communication. I will recommend the school to anyone who asks me for information. The teachers were very good as was the course's content. The course was very good and enjoyable and I will definitely want to go on another one in the near future. The course in Alicante was brilliant. I had the most enjoyable course, I will definitely come back for more! I really enjoyed my two weeks in Alicante, I have learnt a lot. The staff at the school where really friendly and made the course even more enjoyable. I look forward to doing another similar course in the near future.